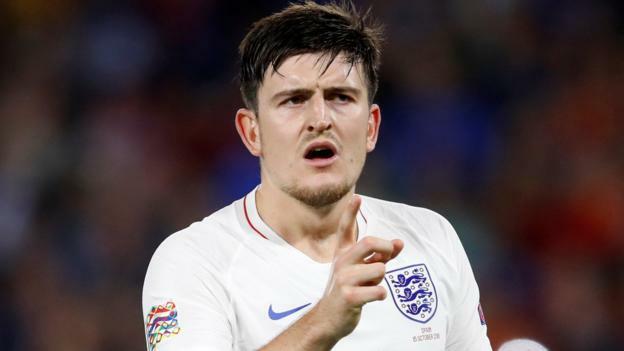 England defender Harry Maguire says he wants to win trophies and play in the Champions League, but owes Leicester City for giving him a platform. Maguire, 25, signed a new five-year deal with the Premier League club in September after being linked with a summer move to Manchester United. The centre-back was one of England’s key players as they reached the semi-finals of the 2018 World Cup in Russia. “I want to concentrate fully on Leicester this year,” Maguire told the Premier League Show. “See where it takes the club and see where we go from there. Maguire was then asked by presenter Gary Lineker about one of football’s “giants” bidding for him in the future. “Yes, definitely it would be a difficult one,” he said. “I’m an ambitious player. “If you’re not an ambitious footballer, you’re in the wrong game really. Maguire began his career at Sheffield United, before joining Hull City in 2014 and then signing for Leicester when the Tigers were relegated three years later. “Since I made my debut at Sheffield United I felt like I could step on and climb the leagues,” he said. “Signing for Leicester, they gave me a great platform to go and play for England as well. “My main aim is to be playing week in, week out in the Premier League and to get picked for England. However, I do want to win trophies. Maguire added: “Growing up you always dream of playing for England, you probably didn’t think it would come real when I was a young boy. Maguire was speaking to the Premier League show before England’s most recent Nations League fixtures – the 0-0 draw in Croatia and the 3-2 victory over Spain. The centre-back scored his first England goal in the summer as Gareth Southgate’s side beat Sweden 2-0 to reach the World Cup semi-finals, where they lost 2-1 to Croatia in extra time. Maguire said his goal against Sweden was the “biggest adrenaline rush I have ever had”, but admitted to not being able to watch the semi-final defeat back. “It’s something, when I think about it all, that brings a bit of sadness to me,” he said. “Although it should be such a happy time, the semi-final still hurts. “I always look back at the second half and think we didn’t handle the ball as well as we had done in the tournament. “I wouldn’t use tiredness as an excuse. Pressure is probably the big thing – it’s a semi-final, you’re so close to it, you don’t want to be the one who makes the mistake.